Home > Offroad Vehicles > Gas Pocket Bikes & Standup Scooters > LANCER X-Scooter 49cc Stand-up Model. Fast Shipping! LANCER X-Scooter 49cc Stand-up Model. Fast Shipping! GREAT GIFT IDEA - FAST SHIPPING TO YOUR DOOR ONLY $59! - LOWEST PRICE GUARANTEED! 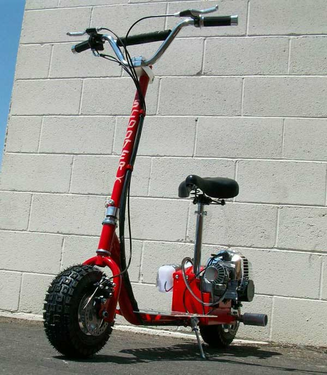 The Lancer X-Scooter 2-stroke has been one of our best selling models since inception. The Lancer came with a 2 stroke 43cc engine, and now has been upgraded to a 49cc engine and we added dirt bike bars, the chrome engine, and now the Lancer comes with larger Off-Road style adjustable handle bars, stunt pegs, and 10" off dual purpose road tires! Seat is optional and cost $45. The Lancer X-Scooter comes standard with the following listed features. Dirt Bike Style Bars: The Dirt bike bars are wider than the standard bar which give you more stability. The bars also give you up, down, back and forth adjustment ability. 49cc Gas Engine: This is one of the most powerfull 49cc motors on the market. Comes stock with high compression Max Power head! 10" x 3.5" Dirt Tires: These tires are meant for on and off road use. They are a dual sport tire for any terrain. This model has the most aggressive tires offered. Front and Rear Hydraulic Disc Brakes: Disc brakes are much safer than drum or band brakes(commonly used on our competitors models). Twist Throttle: This comes standard on all of our scooters. We find the twist throttles are longer lasting than trigger and provide much better response and control. Aluminum Deck: Also standard on all Lancer-X is the aluminum deck, unlike many of our competitors models that use easily breakable wood decks. Rear Foot Pegs: Great for riding doubles and doing wheelies. This unit come with a factory warranty only. Lancer ScooterX's 30 day Warranty covers any part on this scooter that is factory defective or manufacture defect. Meaning if something is mechanically wrong with your product we will take care of it by sending out replacement parts. If something comes broken or missing from package we will send a new part to you immediately. The warranty covers anything that is wrong or goes wrong withing 30 days of purchase date. If you have a broken or damaged part please fill out the parts request form and we will send you a new part. This is found on the bottom of our home page.